You should be a bit concerned if one pair shows a tendency of beeing considerable weaker than the rest. All experience shows that this is an early warning for the entire set is due for replacement. Some easy tricks can postpone the unavoidable for a while – but just for a while. Start saving now! Proper cycling may sometimes revive the weak pair – for a while – and the trick to do first is to reset the car controller fooling it to believe it is supervising a fresh set of batteries. This procedure do only work for the car controllers found in the CityJet5. Older car contollers as the ones found in model 3 and some 4'rs needs a special firmware EPROM to have their counters reset. See below. 1. Locate the Car controller. When sitting in the car, its behind the panel you have around your left knee. Just tear it off – it's velcroed in place. 2. Dismount the car controller from the chassis by removing the two M8 self threading screws. 3. Remove the leftmost cable (marked P1 on some vehicles) by pressing in the latch in the middle of the connector. Do not use force! 4. Open the lid by removing the recessed philips screws around the edges. 6. Now insert jumpers over position S8 and S9 as shown in red. 7. Without putting on the lid, reinsert the cable P1. 8. Turn on the ignition. At this point nothing should turn up in the display but you should hear relays clicking in the back of the car. No panic. This is quite normal. 9. Turn off the ignition and remove P1 again. 10. Remove the jumpers and reinsert P1 and turn on the ignition to verify that everything is OK.
11. Print a service report to verify that all batteries now show 100%. 12. You are done. Put back the lid and put the car controller back in its recess. Older controllers as found in model 3 and some 4's needs a special EPROM in order to have the counters reset. This firmware can be downloaded from the link below. The file contains a binary image that can be burned onto most 27C256 chips (180ns or faster) as the M27C256B. 2. Loosen the car controller from the chassis by removing the two 8mm self threading screws. 5. Carefully remove the original firmware EPROM and insert the erase EPROM. Make sure that it is firmly seated in the correct orientation and no pins are bent or broken. 6. Reinstall the connector P1 and turn on the ignition. Wait a bit, then turn the iginiton off again. 7. 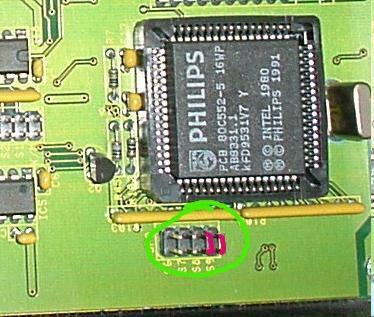 Remove P1 (again), remove the erase EPROM and reinstall the firmware EPROM. Again, make sure that it is firmly seated and no pins are bent or broken. 8. Reinsert P1 (again) and turn on the ignition to check if everything is OK. Then print a service report to verify that all batteries now show 100%. All counters for "put to charge" etc. should read zero. 9. You are done. Remount the lid and put the car controller back in its place. The battery efficiency is perhaps the most important piece of information. The sample shows a set of quite healthy NiCad batteries as the batteries are nominially rated for 100Ah. As you can see the mileage and the ampere hours conters shows garbled data. My experience is that this doesn't matter – it's just annoying. Both ends are ordinary female 9-pin D-sub plugs. Connect pin 1 to pin 1, cross pin 2 and 3 both ways, then connect pin 5 to pin 5. Optionally use the shield in the cable to connect the shields of the plugs. Connect the cable to the 9 pin serial port on the car controller, then insert the other end in your PC. Set up your terminal program to 9600 baud, no parity, 8 data bits 1 stop bit, XON/XOFF handshake and make sure that you're listening on the correct port; COM1, COM2 or whatever. To obtain the data turn off the ignition, then press the TRIP COUNTER RESET button in the middle on the dashboard. (There is a push-button on the car controller itself on some older models.) A similar listing to what shown above should appear on your PC. It's quite handy to keep logs of this: Use the terminal program's logging facility to log the listing to a text file. A Palm III, V or Vx or any Palm compatible device with a serial port can also be used. Devicing your own cable can be a bit tricky due to the special connectors on the Palm but the cable issed with the Palm Travelling Kit (product #10413U for the Palm V/Vx) works perfectly.